The Bengals have signed third round pick Jordan Willis, according to a team announcement. With the defensive end signed, the Bengals now have all eleven members of their draft class under contract. Willis, a former standout at Kansas State, had 11.5 sacks in his final season on campus. Now with the Bengals, the 2016 Big 12 defensive player of the year figures to contribute as a reserve behind starting bookends Michael Johnson and Carlos Dunlap. Will Clarke, Wallace Gilberry, and trade acquisition Chris Smith are also on the DE depth chart. Willis, who has been widely praised for his versatility, may also see time at outside linebacker. The Falcons and 49ers are looking to trade up, according to Ian Rapoport of NFL.com (on Twitter). The 49ers, unsuccessfully, tried to pry the No. 21 pick from the Lions just moments ago. If the Falcons go pass rusher, the names to remember are Taco Charlton, Tarell Basham, or Jordan Willis, Tony Pauline of DraftAnalyst.com tweets. With 22 picks in the books, other notable names remain on the board including Alabama linebacker Reuben Foster, FSU running back Dalvin Cook, UCLA linebacker Takkarist McKinley, and embattled Ohio State cornerback Gareon Conley. Inside linebacker is a need for the Niners, so they could potentially be looking to move up for Foster. McKinley would be a good fit for Atlanta as they seek a pass rusher that isn’t among the three listed by Pauline. Panthers general manager Dave Gettleman believes that there are “half a dozen” three down backs to be had in this year’s draft and estimated that RB is one of the strongest groups, along with defensive end and secondary positions (link via Joseph Person of the Charlotte Observer). When talking to reporters today, the GM was asked he considers Stanford’s Christian McCaffrey to be one of those six players. “He can run it. He can catch it. I guess that’s three downs. [McCaffrey] has certainly shown he can carry the load at Stanford,” the GM said. There has been lots of talk about Carolina targeting a running back at No. 8 overall. Leonard Fournette has been the popular prognostication for the Panthers there, but McCaffrey might also be in the mix. Then again, if Gettleman sees four other tailbacks as well-rounded players, then he might be willing to hold off on addressing the position. Beyond Fournette and McCaffrey, there are also standouts like FSU’s Dalvin Cook, Tennessee’s Alvin Kamara, and Texas’ D’Onta Foreman to consider. The Redskins are smitten with Temple linebacker Haason Reddick, Matt Miller of Bleacher Report (Twitter links) hears. Washington currently picks at No. 17 overall, so Miller believes that acquiring him would require the team to trade up. USC cornerback Adoree’ Jackson didn’t take a visit with the Patriots, but there’s been contact between the team and the player, Doug Kyed of NESN tweets. The Patriots may have to get back into the first round in order to get in the mix for him, however. As of this writing, the Pats’ first selection doesn’t come until the third round (No. 72 overall). Jackson rates as the 37th best player on Daniel Jeremiah’s big board and some draft analysts have him up even higher. Two weeks ago, Falcons coach Dan Quinn put Mizzou’s Charles Harris and Kansas State’s Jordan Willis through a workout side-by-side (Twitter link via Ian Rapoport of NFL.com). Florida cornerback Teez Tabor and Michigan defensive back/linebacker Jabrill Peppers were among the 49ers’ visitors, writes Matt Barrows of the Sacramento Bee. Neither will be in play for the 49ers’ first-round pick (even if they trade down from No. 2), but could still be on the board when the club’s second-rounder comes up at No. 34. Kansas State edge rusher Jordan Willis visited the Panthers, tweets Ian Rapoport of NFL.com. Willis seems like a more realistic fit for the Panthers in the second round (No. 40 overall) than in the first (No. 8). Regardless, with Julius Peppers, Charles Johnson and Mario Addison each on the wrong side of 30, Carolina could use a young pass rusher like Willis, who totaled 20 sacks from 2015-16. Alabama cornerback Marlon Humphrey met with the Cowboys, reports Todd Archer of ESPN.com. Humphrey may well be off the board by the time the Cowboys are on the clock at No. 28, though it’s possible he’ll drop amid unwanted comparisons to another ex-Alabama corner, recent first-round bust Dee Milliner. The Redskins, owners of the 17th pick, hosted Houston edge defender Tyus Bowser, according to Jason La Canfora of CBS Sports (Twitter link). Washington amassed the ninth-most sacks in the league last year, though nine of their 38 came from outside linebacker Trent Murphy, who will serve a four-game suspension to open the season. He’s also due to hit free agency next spring. Adding another pass rusher early in the draft this year could make sense, then. Bowser racked up 22.5 sacks during his four-year college career, including a personal-best 8.5 in 2016. Texans head coach Bill O’Brien “absolutely loves” Texas Tech quarterback Patrick Mahomes, according to one report, but Houston’s interest could be a smokescreen, writes Tony Pauline of DraftAnalyst.com. Pauline spoke to sources close to the organization who pointed out that the Texans are in win-now mode, meaning they’re more likely to use their first-round pick (No. 25) on a player who can make an immediate impact than select a project like Mahomes. There’s also a sense that current starting signal-caller Tom Savage‘s familiarity with O’Brien’s system will enable him to successfully transition from a backup to a No. 1. As such, there’s a stronger probability of the Texans taking an offensive tackle or a cornerback than a QB with their initial pick, per the sources. “Several” clubs have concerns regarding Alabama cornerback Marlon Humphrey, notes Pauline. Specifically, they fear that Humphrey is too much of a straight-line defender and someone who’s only capable of playing in limited schemes. Those teams liken him to ex-Crimson Tide corner Dee Milliner, who, despite going ninth overall to the Jets in 2013, is no longer in the NFL. 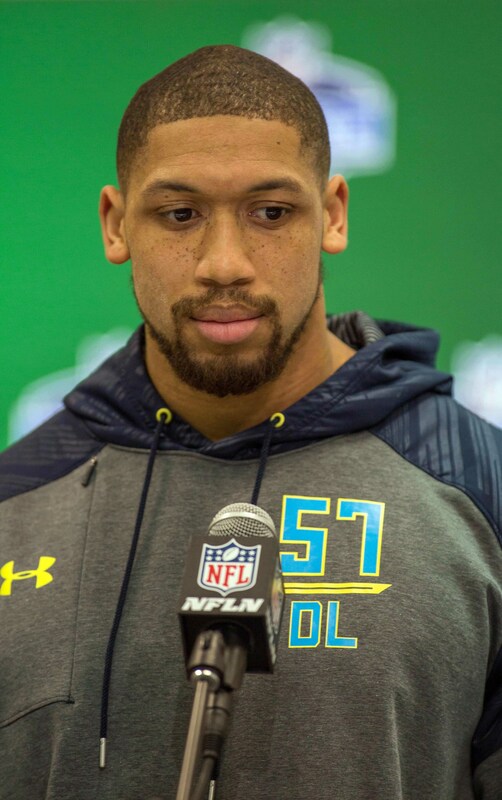 Kansas State edge defender Jordan Willis was among the Ravens’ pre-draft visitors Tuesday, and Houston’s Tyus Bowser will meet with the team Wednesday, relays Albert Breer of The MMQB (Twitter links). Daniel Jeremiah of NFL.com ranks Willis as the 49th-best prospect in the 2017 class – right in the vicinity of the Ravens’ second-rounder (No. 47) – and rates Bowser an even better 36th. Missouri defensive end Charles Harris‘ stock has risen so much that he could come off the board before Tennessee DE Derek Barnett, per Jordan Raanan of ESPN.com (Twitter link). Jeremiah places Harris 21st in his rankings and Barnett 13th, and PFR’s Dallas Robinson currently has the former going 26th overall and the latter ninth. Harris recently worked out for the Falcons, as he tells Vaughn McClure of ESPN.com. Indiana offensive lineman Dan Feeney could be a late first-rounder or an early second-rounder, according to Pauline, who reports he has visited the Vikings, Bears and Colts. Feeney also has meetings with the 49ers and Rams on tap. The Dolphins have also worked out Feeney, per Barry Jackson of the Miami Herald, who adds Miami has also spent “considerable time” with Western Kentucky guard Forrest Lamp. Stanford running back Christian McCaffrey, whose stock is so high that he could be a top 10 pick in this year’s draft, will visit the Redskins and Broncos, reports Ian Rapoport of NFL.com (via Chase Goodbread of NFL.com). Given where they’re slated to select (Washington’s at No. 17, Denver’s 20th), those two teams could have difficulty reeling in McCaffrey, though it would make for an especially interesting story if he ended up with the Broncos. His father, Ed McCaffrey, was a standout receiver in Denver from 1995-2003. While there, he caught passes from quarterback John Elway, who’s now the Broncos’ general manager. Ohio State cornerback Gareon Conley has already visited the Titans (along with the previously reported Cowboys and Browns), and will meet with the Bengals and Jets, writes Nate Ulrich of Ohio.com. Conley seems like a shoo-in to go somewhere in the first round, and PFR’s Dallas Robinson currently has him going 11th overall to New Orleans. Oklahoma running back Joe Mixon visited the Buccaneers this week, tweets Mike Garafolo of NFL.com. The potential second- or third-round pick could be a fit for a Tampa Bay team whose incumbent starting running back, Doug Martin, isn’t a lock to remain with the club. Even if Martin doesn’t lose his roster spot, he’ll still miss the first three games of next season as a result of a suspension. Michigan defensive end Taco Charlton visited the Lions on Friday, per Rapoport (Twitter link). As Rapoport further notes (and as was previously reported), the Cowboys and Dolphins are also among the teams interested in Charlton, who’s coming off a 10-sack season with the Wolverines. Tennessee quarterback Joshua Dobbs visited the Steelers on Monday and will also meet with the Chiefs, relays Tom Pelissero of USA Today. Dobbs, who was a two-year starter with the Volunteers, could go as high as the second or third round, according to ESPN draft analyst Mel Kiper Jr. (via Mike Griffith of SEC Country). Kansas State defensive lineman Jordan Willis visited the 49ers on Wednesday, reports Matt Barrows of the Sacramento Bee. Willis figures to go late in the first round or early in the second, which could make him a target for the 49ers at No. 34 overall. Offensive lineman Forrest Lamp is starting to look like a Round 1 lock, according to Tony Pauline of DraftAnalyst.com. Lamp, a Western Kentucky product, will likely play guard in the NFL after playing tackle in college, but he offers versatility that intrigues clubs, as he could slide to the blindside or even to center if needed. The Packers and Vikings both have interest in Lamp, per Pauline, as do the Seahawks. The Falcons, Panthers, and Titans have all put Lamp through a workout, reports Pauline. Like Lamp, Washington cornerback Kevin King will probably sneak into the back end of Day 1, says Pauline. Not only does King offer size (6’3″, 200 pounds), but he impressed scouts with a 4.43 40-yard dash. Plus, injuries to fellow defensive backs Sidney Jones and Fabian Moreau means other corners, such as King, will see their stock rise as the draft approaches, as supply no longer meets demand. The Buccaneers have worked out King, while the Jets plan to do the same, per Pauline. Scouts view North Carolina State safety Josh Jones as a top-50 pick, according to Pauline, and a number of clubs have already expressed interest. Jones has worked out for the Jaguars and will meet with the Cardinals, Steelers, Ravens, Dolphins, and Jets. While Mel Kiper Jr. of ESPN.com ranks Jones as just the seventh-best safety on the board, Daniel Jeremiah of NFL.com places Jones within his top-50 players (No. 48). The Jaguars have visited with Kansas State defensive end Jordan Willis, reports Pauline, and the Eagles, Buccaneers, Dolphins, and Cowboys all plan to meet with the edge rusher, as well. Even with that level of interest, Willis will still likely end up being selected at the beginning of the second round rather than at the end of the first, writes Pauline. The Saints have already put Willis through a workout. We heard earlier this month that the Buccaneers have “loose plans” for Doug Martin, which seemed to substantiate a prior report that the team was considering retaining their long-time running back. Martin, who will be suspended for the first three games of next season as part of a four-game ban he received in 2016 for violating the league’s PED policy, recently completed a voluntary rehab stint and met with head coach Dirk Koetter and GM Jason Licht a week before the scouting combine. Koetter and Licht both had nice things to say about Martin, but they were still vague on his future with the club. As Rick Stroud of The Tampa Bay Times writes, there are a number of factors working against Martin’s return, including his injury history, the above-referenced suspension, and the fact that his salary is no longer guaranteed as a result of the suspension. Cummings believes the team would be wise to select a running back from the deep class of RBs in the 2017 draft, and if the Bucs land one of this year’s top prospects, that might spell the end of Martin’s tenure in Tampa Bay. Roy Cummings of Florida Football Insiders says that the Buccaneers‘ recent signing of Nick Folk suggests that the team is prepared to move on from Roberto Aguayo, though Tampa Bay could carry two kickers next season if need be and have Aguayo serve as a kickoff specialist if he cannot beat out Folk for full-time duties. Folk recorded just 39 touchbacks in 2016, the third-worst mark in the league, though he and Aguayo averaged the same distance average on kickoffs. The Saints need to bolster their pass rush in 2017, and after signing Alex Okafor earlier this week, they are now meeting with one of the better pass-rushing prospects in this year’s draft class. As Herbie Teope of The Times-Picayune writes, the club is meeting with Kansas State DE Jordan Willis today. Willis is considered a second- or third-round prospect, and New Orleans has been monitoring him in recent months. Free agent safety Duke Ihenacho will apparently not return to the Redskins in 2017. As Peter Hailey of CSNMidAtlantic.com writes, Ihenacho fired off several cryptic tweets over the past couple of days indicating that his time with Washington is over. Given that the Redskins recently acquired D.J. Swearinger and plan to move Su’a Cravens back to safety, Ihenacho’s departure makes sense. Jordan Raanan of ESPN.com believes there is currently a 50-50 chance that DT Johnathan Hankins returns to the Giants. He also hears that Big Blue wants to add a physical power back to complement Paul Perkins, and LeGarrette Blount could be an option in that regard. Dave Birkett of The Detroit Free Press examines seven free agents still on the market that could benefit the Lions, including LB Zach Brown and DE Chris Long.